Welcome to the comprehensive online resource for primate information. 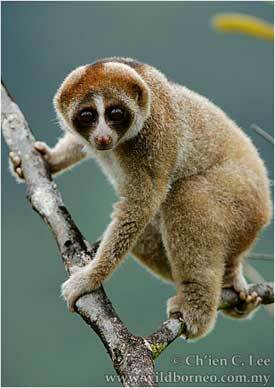 Apes, gibbons, monkeys, tarsiers, lemurs, and lorises make up the diverse and beautiful world of primates. We humans are primates, and in order to know ourselves, we need to know about our biological cousins. What do they look like? How do they move? Where do they live? What do they eat? How do they relate to each other? Here you will find out all this and more about all the world’s primates. Developed for students, researchers, and anyone interested in our closest relatives, All The World’s Primates illustrates the diversity of our taxonomic order. The foundation of the website is a relational database with contributions from more than 300 scientists, most of whom have done research on primates in their natural habitats. Containing all of the 505 species and 195 subspecies recognized by the International Union for Conservation of Nature (IUCN), as well as exciting current discoveries, the database details habitat, social behavior, diet, physical measurements, risks of extinction, and other facts critical to understanding primate lives. Users can organize primates by multiple methods that best suit their needs. Fully referenced with over 10,000 citations, the data accompany more than 3,000 photographs, as well as interactive maps for each species and subspecies, video, audio, links, search tools, multilingual glossaries, review articles, and other resources. Today the future of many primate populations is in doubt. Thirty percent of primate (123 species) are endangered or critically endangered. Only 27% of primates are classified as least concern.. Joining All The World’s Primates makes you a member of Primate Conservation, Inc., a nonprofit private foundation funding field research and conservation projects on the least-known and most endangered primates in their natural habitat. game camera trap during the study. Congolese forests contain some of the most diverse primate communities, yet many are poorly studied. The Lomami River basin is one of the most remote forests in DR Congo. The Lukuru Foundation documents the region's biodiversity and initiated the establishment of Lomami National Park (LNP). Two years after a new species, lesula (Cercopithecus lomamiensis), was described, the foundation had another exciting discovery: an unknown population of dryas monkeys, Cercopithecus dryas. A hunter's kill identified in the LNP buffer zone represented a range expansion of this poorly known and critically endangered species, thought to be restricted to forests around the Wamba and Kokolopori Bonobo research sites (400 km [249 mi] to the north). The Lukuru Foundation has conducted several camera trap surveys and recorded primate encounters on thousands of kilometers of park patrols but never detected dryas monkeys until 2014. With partial funding from PCI, my project studied the feeding, ranging, and positional behaviors of aye-ayes in the continuous forest of Torotorofotsy, Madagascar. Previous research on aye-aye populations suggested that either Canarium seeds (Iwano and Iwakawa 1988; Iwano 1991) or Ravenala nectar (Ancrenaz et al. 1994) is the aye-aye's critical resource. Invertebrates were said to be consumed in significant quantities only when other resources were unavailable (Sterling and McCreless 2006; Lambert 2007; Marshall and Wrangham 2007). However, all of these studies were conducted on introduced populations on the island of Nosy Mangabe (Iwano and Iwakawa 1988; Iwano 1991; Sterling 1994) or in disturbed habitats (Ancrenaz et al. 1994). Because primate behaviors can be altered by deforestation and small forest sizes (Irwin 2008; Chaves et al. 2012), it follows that these earlier-recorded aye-aye behaviors may not reflect those of naturally occurring populations in a continuous forest. My main objective was to determine the significance of invertebrates in the ecology of aye-ayes. I found that invertebrates are the aye-aye's most commonly consumed resource, especially those contained within live trees (Sefczek et al. 2017). Additionally, aye-aye home range sizes, 808 ha (1997 ac) for a female and 1586 ha (3919 ac) for a male, are larger than initially suggested (Sterling 1994), possibly due to the reliance of dispersed invertebrates as the main food source. Positional behaviors also appear to be largely adapted for invertebrate feeding, though results are still being analyzed. Timothy Sefczek (left) with his team of field assistants. A Multi-faceted Approach to Understanding Arboreal Primate Abundance and Local Perceptions and Livelihoods in a Protected Area. In studying Preuss’s red colobus (Piliocolobus preussi), Alexandra Hofner found that in one month 107 diurnal primates were killed by Ikenge hunters; Cerco’pithecus nictitans made up 41.9% of the reported offtake, C. mona 29.9%, C. erythrotis 12.2%, C. pogonias 12.2%, P. preussi 2.8%, and Mandrillus leucophaeus 1%. Alexandra suggests that because of steep population decreases in some primate species (such as P. preussi), Ikenge hunters may be targeting more abundant primates. Alvaro Gonzalez-Monge conducted his PhD project at Veun Sai’Siem Pang National Park, in Ratanakiri Province, Cambodia. He originally planned to study douc langurs but changed his dissertation subject to the Annamese langur (Trachypithecus margarita) because very little was known about this species in Cambodia. Initially, his focus was on the species’ socio-ecological and taxonomic placement. However, because illegal logging was rampant in the area at the time, he decided he would also study the effects that this disturbance had on the group’s behavior and habitat use. Alvaro found that these langurs were somewhat resilient toward human disturbance and were highly adaptable in their resource use, but logging had a significant impact on their ranging and habitat use. The langurs moved higher in the canopy as logging intensified. The study group even abandoned sections of their home range after heavy logging was carried out. Alvaro observed that the langurs slept and fed on the seeds and leaves of some of the tree species that are actively sought by loggers, which is cause for concern if logging remains unchecked. This study has helped increase our knowledge about one of the least-known species of Indochinese primates, but it also provides local people with an alternative livelihood as research assistants, which helps protect the natural heritage of the Annamitic region. Alexandra Miller studies the social organization of Adolf Friedrichs’s Angolan colobus monkeys (Colobus angolensis ruwenzorii). She recently reported counting 512 individuals crossing a main road. These monkeys eat fruits, lichens, mature and new leaves, and flowers. They come to the ground to feed on terrestrial herbaceous vegetation such as Sericostachys sp. and Impatiens sp. While on the ground, they appear to stay in their family group and are often on the alert for chimpanzees, which are known to kill and eat them. In the photo at the top of the page, they look as if they are waiting for a family photo to be taken. 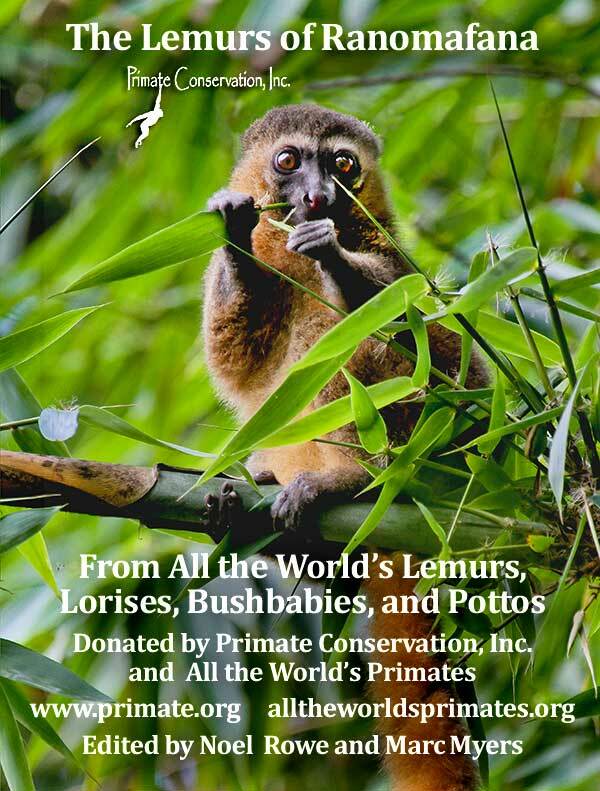 A generous donor to Primate Conservation, Inc. (PCI) has offered to subsidize the purchase and distribution of a number of All the World’s Primates books to primate habitat country conservation organizations. If you are a member of one of these organizations and could use copies of this book (for a description go to www.pogonias.com), please answer the following questions and send your information to Noel Rowe at reports@primate.org. Your organization's name, mailing address, and email. Name and CV of a principal in your organization. Date your organization was founded. URL of your website, if any. Are you affiliated with or primarily supported by a larger organization? Is your annual budget under $10,000 US, $10,000 to $100,000 US, or over $100,000? What primates does your organization work to protect? In 500 words or less, how will the book(s) be used by your organization? Please, do not include any information as attachments. Only material in the body of the email will be considered. The decision about which organizations will be awarded these books is up to the donor and the Board of Directors of PCI. Submissions must be made no later than August 10, 2017. Only winners will be notified. We will not share any of your information with others. You may get an annual email from PCI. All The World’s Primates is sharing a free ebook, The Lemurs of Ranomafana. Created for the participants in the recent Prosimian Congress in Ranomafana National Park, Madagascar (August 2013), we thought others might like it. It’s available as either a mobi file (for Kindle) or epub for iPad, tablet, smart phone or other reader. Download link below. The Lemurs of Ranomafana is adapted from Pogonias Press’ new ebook All the World’s Lemurs, Lorises, Bushbabies, and Pottos (Amazon $9.95). 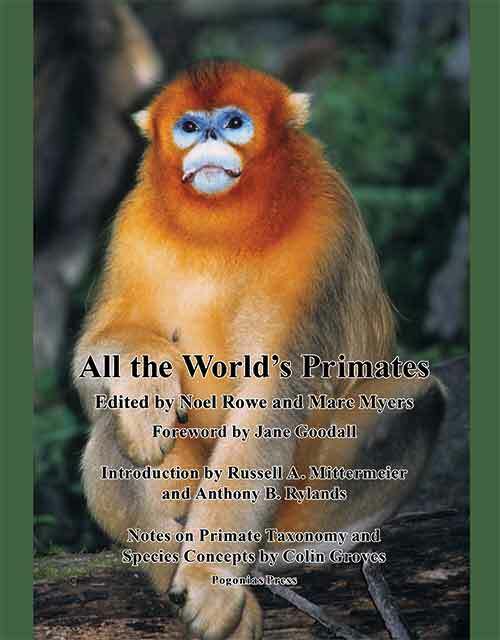 Planned as the first volume in a series, it illustrates the diversity of the fascinating suborder Strepsirhini, a group which contains many of our oddest, rarest, most beautiful, and least-known primate relatives. More than 100 photographers and primatologists who contributed to this website were involved. The Lemurs of Ranomafana is available, free here. An international team of scientists studying the elusive nocturnal primate the slow loris in the jungles of Borneo have discovered an entirely new species. The team’s analysis of the primate’s distinctive facial fur markings, published in the American Journal of Primatology, reveals the existence of one entirely new species, while two of species, previously considered as possible sub-species, are being officially recognized as unique. Note that this post is a departure as the project is not presently supported by Primate Conservation, Inc. (PCI). This technology has potential in conserving primates and so is presented here. Dr. Wich is a contributor to All The World’s Primates for orangutans and Thomas’ Langur. He has also reviewed proposals on PCI’s behalf. The distribution and density of orangutan nests, critical to conservation efforts, have traditionally been obtained by costly and time consuming ground surveys. High resolution satellite imagery that might serve the same purpose has been too costly or simply unavailable. But Researchers Lian Pin Koh and Serge Wich proposed what seemed at first to be a wild idea: conservation drones. The researchers have tested the conservation drones above orangutan habitat in Sumatra and Sabah (Borneo). The aim of these tests was to determine whether the system could really detect orangutan’s nests. The results are in and it can! Conservation Drones are inexpensive, autonomous and operator-friendly unmanned aerial vehicles for surveying and mapping forests and biodiversity. They are able to fly pre-programmed missions autonomously for a total flight time of up to ~50 minutes and over a distance of ~25 km. Depending on the camera system installed, these drones can record videos at up to 1080 pixel resolution, and acquire aerial photographs of <10 cm pixel resolution. Aerial photographs can be stitched together to produce near real-time geo-referenced land use/cover maps of surveyed areas. Since June, I [Jackson] have been working on my dissertation project, “The effects of crested gibbon (Nomascus annamensis) seed dispersal patterns on tree regeneration,” in the Veun Sai–Siem Pang Conservation Area, 55,000 ha managed by Conservation International and the Cambodian Forestry Administration in a remote part of northeastern Cambodia. I have been working with local ethnic minority researchers and one American volunteer (who hopes to go to graduate school) to understand the importance of northern buffed-cheek crested gibbons to trees. 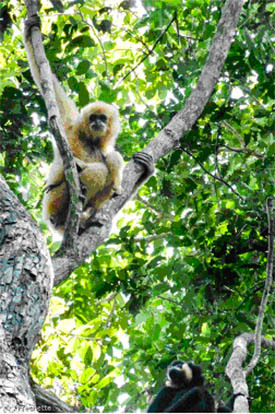 This is a new gibbon species that was described in 2010 using acoustic and genetic data. I am looking at seed dispersal patterns of these gibbons and how those patterns may be important for trees to regenerate. To do this, I quantified the gibbon seed dispersal pattern by mapping where every seed of a particular tree (Microcos paniculata) was defecated. Then, using that pattern, I planted 9,000 seeds of that tree, mimicking the gibbon pattern, a bird dispersal pattern (which I quantified as well), and a pattern where all the seeds just fall beneath the fruiting trees. The purpose of this is to test if there is a difference in seed germination between these dispersal patterns. 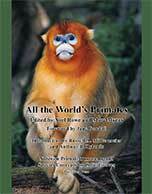 ...be amazed by the diversity of the world’s primates in this beautiful book. Fifty percent of the proceeds goes to primate conservation. Send us the tear off from your copy to become a member of Primate Conservation, Inc. with free access to this website.